About the Book What do sporting champions do, what makes winning teams, who is a good leader, why do only some teams keep winning while others win only for a while and then lose... Two IIMA alumni, Sports commentator and writer Harsha Bhogle and advertising and communication consultant Anita Bhogle dig into examples from sport to see how they can benefit managers. Contrary to popular perception ability is not a major distinguishing factor in success, especially as the level of competition increases. But if you combine your ability with the right attitude and the passion to excel, you too can become the best that you can be. That is the universal formula for winning that The Winning Way explores. 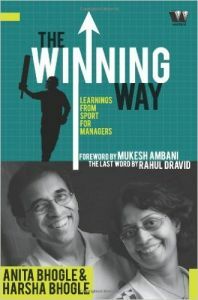 For Anita and Harsha Bhogle, this book marks the completion of 300 successful corporate workshops of The Winning Way that they run. Harsha Bhogle graduated from Osmania University in chemical engineering and then did a postgraduate program in management from Indian Institute of Management. He worked in advertising for two years and then moved in to the world of broadcasting. He has been presenting cricket on ESPN and Star Sports for the last twelve year and even had a program called Hunt for Harsha named after him. Now he has become a familiar face in Indian cricket.Anita Bhogle is an Indian Institute of Technology, Mumbai post-graduate in statistics. She is also has a postgraduate degree in management from Indian Institute of Management, Ahmedabad. Anita started her advertising career 10 years back and has been running a communication consultancy and qualitative research agency called Prosearch since then.